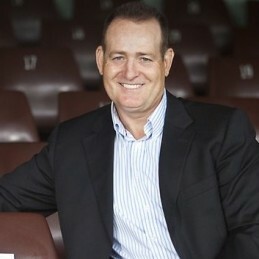 A household name in Rugby, David Campese played for Australia for 15 years and New South Wales for 11. Until recently, his 64 tries was the world record for the most number in a Test match. David was the first Australian, and one of only five in the world, to play more than 100 Tests. In 1997 David was inducted in the Australian Sport Hall of Fame then in 2000 received the Australian Sports Medal and a Centenary Medal in 2001. The following year David was honoured with the Order of Australia for his service to Rugby Union as a player, promoter of the sport, and to the community. He was an inductee into the Australian Rugby Union Hall of Fame in 2007 and the IRB Hall of Fame in 2013. Following his retirement, David’s media career has seen him pour continual insight and opinion into rugby audiences. Former coach Allan Jones refers to him as “the Don Bradman of Rugby”. For six years David has written Campo’s Column, found weekly in the Sydney Daily Telegraph, taking an honest but often controversial attitude to his writing. He has also released a book, On a Wing and a Prayer, as well as contributing to many other publications. David’s opinions on issues are always in-demand by the media and rugby public. Through 13 years of public speaking engagements, David has mastered capturing and entertaining audiences. His long-standing appeal continues to attract dates with corporate audiences, schools, and sports clubs.